Human–computer interfaces (HCI) are common in the present-day world. However, in situations where these are not doable, an alternate way is needed for realizing communication. This gives rise to what is also known as brain–computer interface (BCI) that provides a way of communication between the human brain and a machine in quite an effective way. BCIs are bliss for physically impaired patients. The dominant feature in a BCI is the neural activity generated in the brain by any stimulus. 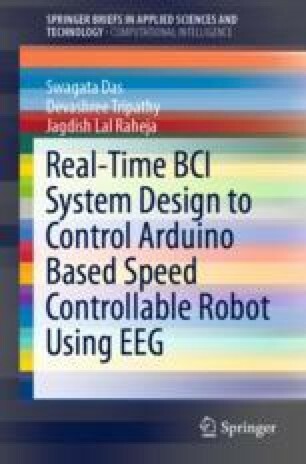 The concept includes encoding of brain signals through an electroencephalography (EEG) acquisition device and a computer to generate commands to gain control over another device which can be the computer cursor, a humanoid robot or an assistive mechanism. The process followed in the functionality of a BCI device can be explained as follows. It is initiated with an intent generated by the user which is meant to produce a speech, action, or motor activity. This intent, at the same time, gives rise to a complex signal with deterministic peaks in the brain, commonly known as EEG signals. The signals, when transmitted to the nervous system and to the muscles, result in performance of the intended action. The same intent generated signals when extracted through a BCI can be used to control a device helpful for the user/patient. In other words, a BCI bypasses the process of transmission of neural signals from the brain to the motor parts through a computer into an applicable device. Brain Vision UK. The Brief History of Brain Computer Interfaces. http://brainvision.co.uk/news-2/the-brief-history-of-brain-computer-interfaces-2. Grabianowski ed. How Brain Computer Interfaces Work. http://computer.howstuffworks.com/brain-computer-interface2.htm. Spinal Cord Injury Research Evidence (SCIRE): American Spinal Injury Association Impairment Scale (AIS). International Standards for Neurological Classification of Spinal Cord Injury. http://www.scireproject.com/outcome-measures-new/american-spinal-injury-association-impairment-scale-ais-international-standards.